We’re one month in! Are you excited? So, we’re one month into the New Year! How is 2018 going for you? Are you feeling excited about your life? Do you feel driven towards achieving what you’d like to achieve this year? One month in, for many people is a dip. The motivation and drive that was there at the beginning of the year starts to fade away and we got caught up in our day to day living and we forget to design our life the way we want it! You see, many people know what they would like to do but they never do it! The reason is that they’re lacking the drive that only being excited about your life can give you! Instead of getting excited about the things we want and working towards them, we often turn to worry, feelings of lack, hard work and not good enough! Think about it, if you’d like to own your own home- do you spend more time feeling excited, looking up brochures of what you really want, getting that clear in your mind and working towards it OR do you spend most of your time focusing on your lack of savings, on the difficulty of getting a mortgage, and on the fear of taking a big step? Whatever you focus on will determine your outcome, it will determine the results that you get! Your perfect life isn’t going to fall into your lap, you need to go out and make it happen! I’m a big fan of personal power, I honestly believe that most of us haven’t even tapped into the vast resources that we have within ourselves to do, be and have whatever it is we want. I know you might be thinking, ‘well yeah that sounds great but surely just wanting something doesn’t just make it all happen?‘ I couldn’t agree with you more. If there’s something that you want in your life, you need to get excited about it! Turn it into a goal and immediately follow that with developing a plan and action steps towards its achievement. You already have the power to do this, you have the power to take action. If you haven’t been able to summon it up until this point, it’s simply because you’re focusing on the fear and difficulty rather than the crazy excitement and good feelings you will have as a result of achieving it! Often the things that we want seem so unattainable, they just seem to be too far away from where we are right now and we can’t see how we could possibly get there. That is what stops most people from even trying BUT that’s how it is for everyone. 99% of people don’t know how they’ll achieve what they want to achieve but they go after it anyway, trusting that the path will become clearer as they go. Jack Canfield Author of ‘Chicken Soup for The Soul’ described his understanding of this principle……. “A car driving through the night, the headlights only reach 100 – 200 feet in front of the car. But you could make it all the way from California to New York whilst driving in the dark, because all you have to see is the next 200 feet. And that’s how life tends to unfold before us. If we just trust, the next 200 feet will unfold, and the next 200 feet after that and so on. Your life will keep unfolding and it will eventually get you to the destination of whatever it is that you truly want”. The important thing is not necessarily that you know how you will achieve what you want, but more so the definite decision that you will go after your dreams and get excited about it! Trust me, just take the first step, and then the next step will come into your view. If you’d like get crazy excited about your life in 2018 and ACTUALLY make the changes you want to make and ACHIEVE the things you want to achieve, then check out a VIP Day with me! This is the ultimate in 1-1 coaching where we get to spend a whole day together to map out your desires, create a plan and MAKE DECISIONS on what you will do to get there! I only have 4 spaces left for these intensive sessions in February so book in with me for a free 30 minute call and let’s explore if it’s for you! Click here to book in for your free chat! Until next time, get excited! This entry was posted in Progress and tagged excitement, goal setting, life design on January 27, 2014 by admin. 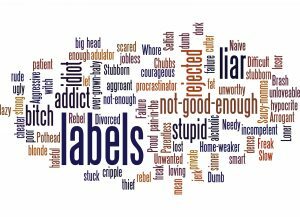 Probably one of the biggest obstacles that you will face anytime that you want to make a change in your life is……….Your Label. You have been branded and labelled from infancy and the extent to which you have bought into this labelling, is the extent to which you’ll find it difficult to discard. As much as I cringe to say it, but for many of us, we are who we have been told we are. We’re wearing our own brand and it can be quite restrictive. Your labels, positive or negative, have boxed you in quite nicely! A label/branding/story- call it what you will, that really seemed to stick to myself and my sister Lyn was that, at some point in our childhood, someone said ‘Lynda got the looks and Paula got the brains’ or something along the lines of that! That statement stuck to us like glue! It was a label that defined both of us for years. Lyn assumed that she wasn’t academic or smart and gave herself a really hard time about that; I just didn’t bother with my appearance and had really low self-esteem about how I looked! Who you are is who you have been up until this moment. It is our choices and how we respond to our environment that ultimately shapes our lives. Once the deck has been cut, you’re the one dealing the hand. It sounds easy doesn’t it? That we can just choose to respond to our environment in a different way than we have done for the past 20 years! I agree that it sounds easy but putting it into practice can be quite difficult. Now remember, I said difficult; not impossible. First you must free yourself! Awareness is power! Lyn and I both knew that this statement had been made and we both knew that it had defined us. But when we talked about it, it began to lose its power. You know the way if you buy a new item of clothing, the label might be stuck on but as soon as you see it, you start to pick it off. That’s exactly the same here, as soon as you see it, start picking off the old, untrue and outdated labels! So, who predicted your future? What label might be boxing you in? Step 2: What’s stuck on you? If you’re someone who has been labelled as ‘always late’ and it’s something that you no longer want to be true; then drop it now. This actually is one of mine! I was always late for school, probably because I wasn’t bothered about it but I was always told my friends, by teachers, by the person in charge of detention ‘Paula, you’re always late.’ That was a label which stuck with me for years; I was always late because that’s who I was. I was someone who was always late. I definitely wanted to re-brand that aspect because I hated being late, it made me anxious and tense! So I picked off the label and rebranded as someone who is on time. I developed new habits by modelling people who were on time. I actually plan to rebrand myself again and someone who is always early! You are the author of your own life. Only you can take the credit. Only you can take the blame. You are writing your story every day based on how you choose to respond to your environment! The question is not ‘Who Am I?’ but ‘Who do I want to be?’ This question takes you out of the box that you’ve been hiding in, forces you to look at the labels and decide if you want to rebrand because the truth is that your story could be amazing! I hope you enjoyed this issue of Progress! I’d love to hear what labels you’ve decided to pick off and how your story will change as a result! Drop me a line and let me know! Also, I was just wondering how are you going to change your life this year? What are you going to do differently? I’m running the Fairy Godmother Programme for the last time in 2016 next week! It will be a whole month focused on YOU! You will walk away with focus, clarity, confidence and determination to make it happen. It’s an amazing way to spend a month! Check it out here! This entry was posted in Progress and tagged boundaries, can i be happy?, growing up, happy in your twenties, Life Coaching, what's your label? on January 6, 2014 by admin.